Hello @dee. @aran is obviously fully busy so can I maybe ask you to give @Gareth_ap_Alun deserved blue badge? 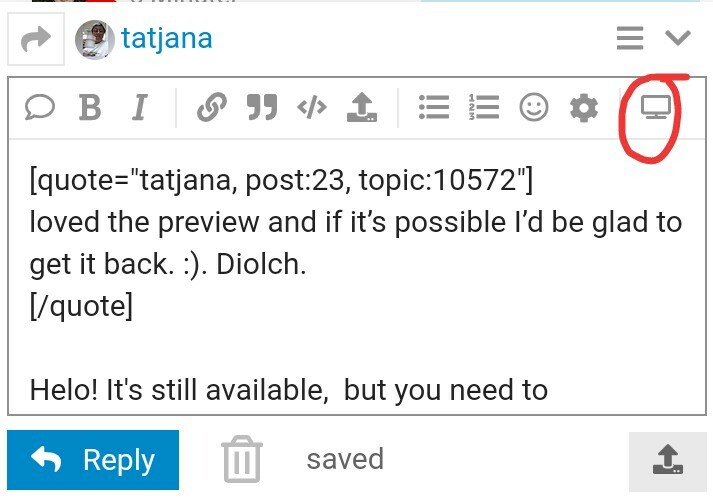 Diolch @tatjana! It was a bit tricky negotiating the new forum layout, but I found how to do it! By the way Ifan, there’s the window for previewing the post when you write it but it actually doesn’t show any preview at all. I loved the preview and if it’s possible I’d be glad to get it back. :). Diolch. To continue in style of the topic … here’s my answer to the (I believe first one) question from @garth-weymont which was posted quite a time ago. Hello @garth-weymont. Here’s my answer to your question. So, do I deserve my blue badge now also? Here’s my answer to Rachel’s question. Edited to fix broken link oops! loved the preview and if it’s possible I’d be glad to get it back. :). Diolch. Well, this of my post is a bit old and the preview goes on the right by default (at least for me), but thanks anyway. and I would love a blue colour os gwelwch yn dda! Diolch yn fawr iawn, Cassie. Ooh, It’s a bit like trivial pursuit this… pls can I get a blue wedge (badge) now?